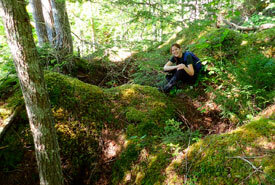 The Nature Conservancy of Canada (NCC) has been working in Cape Breton since 1971. Sight Point in the Mabou Highlands was NCC’s first protected area in Atlantic Canada. In the fall of 2017, NCC announced the protection of 676 acres (274 hectares) of extraordinary habitat in central Cape Breton. The properties are located in three conservation areas at Marble Mountain, West Lake Ainslie and Ottawa Brook. They include diverse Acadian forest and a wetland supporting a provincially significant group of rare plants. The landscape also feature dramatic karst (gypsum-based) white cliffs, sinkholes and caves. These conservation areas are the first in NCC’s plan to protect unique habitats and ecosystems in central Cape Breton. In particular, NCC aims to conserve some of the best remaining intact examples of rare gypsum ecosystems in North America. NCC has strategically acquired these properties to provide wildlife corridors. They also connect to nearby provincially protected sites, including North Mountain Wilderness Area, Cain’s Mountain Wilderness Area and the Black River Bog Nature Reserve. By providing habitat connectivity, NCC is helping to maintain biological diversity and reduce the loss of plant and animal species. Three species of birds listed under the federal Species at Risk Act have been found on these new properties. This includes rusty blackbird, Canada warbler and olive-sided flycatcher. These projects were supported thanks to the Government of Canada’s Natural Areas Conservation Program and Ecogift Program. The Nova Scotia Crown Share Land Legacy Trust, US Fish and Wildlife Service and many private donors also contributed to the success of these projects.